Ryan Blaney and the No. 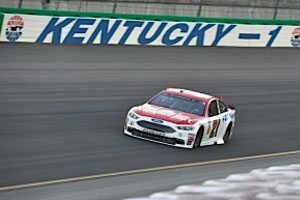 21 Motorcraft/Quick Lane team came away with a top-10 at Kentucky Speedway Saturday night thanks in large part to a true team effort. The Motorcraft crew started sixth but struggled with a loose-handling car in the early going of the 400-mile run. Crew chief Jeremy Bullins responded with a series of chassis adjustments that allowed Blaney to race among the top 10 as the night went on. Bullins also made a key strategy decision that led to a strong finish on a night that could have easily ended in disappointment. After a penalty for speeding on pit road dropped Blaney out of the top 20 midway through the second Stage, Bullins opted to stay on the track during the caution period at the end of that Stage. That put Blaney in second place for the restart and in position to finish the race with just one more pit stop. With the adjustments made to the No. 21 Fusion, Blaney was able to maintain a spot in the top six until he pitted under green with 59 of the scheduled 267 laps still to run. He faded out of the top 10 as the laps wound down, but a caution flag just as the race leader was headed for the white flag set up an overtime finish. Blaney pitted for two fresh tires, restarted 11th and was running 10th when the race’s final caution froze the field at that point. It was his seventh top-10 finish in 18 races this season, and gave the Motorcraft/Quick Lane team a boost in momentum after a disappointing end to the race at Daytona a week ago. “And he made a great call to stay out at the end of the second Stage. “His move worked because the car was fast enough to maintain position the rest of the way. Blaney earned 27 championship points for the night and remains 13th in the standings. In his post-race comments Blaney agreed that Bullins’ call to stay on the track when the leaders pitted at the end of Stage Two was a pivotal move. Blaney and the Motorcraft/Quick Lane team return to action next week at New Hampshire Motor Speedway.